Hey all! I hope you have lots of stuff planned for this weekend. Are you heading to the pool? 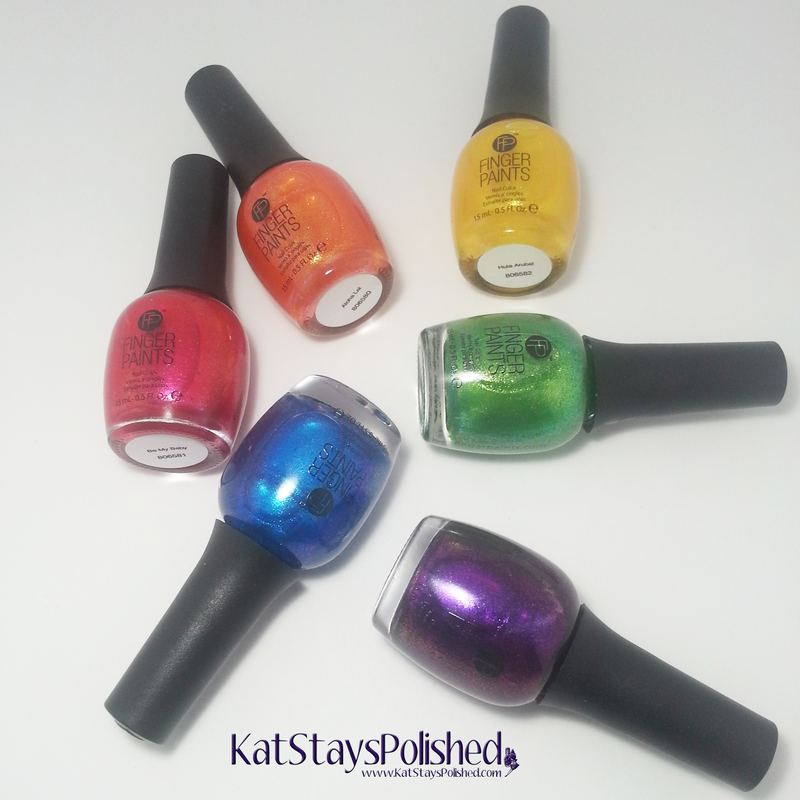 If your answer is YES, then maybe you should get your hands on this FingerPaints Poolside Paradise collection! I have 6 shimmery and summery shades for you so keep reading to see swatches! First is this shimmery hot pink color called Be my Baby. I applied 2 coats and it was perfect. It's almost blinding the way the light reflects off this color! Definitely a fun, bright shade for the poolside! Aloha Lei is a bright orange shade that applied well in just 2 coats. It's a juicy color for the summer and makes me crave all sorts of fruity, tropical drinks! Hula Aruba is a sparkling yellow shade and needed 3 coats to get opaque. Usually with yellow shades I end up always needing 3 coats. I love this color for summer! If you don't like it on its own, definitely work it into some sort of easy nail art design! Margarita Mambo is actually a very subtle green shimmer shade. This one surprisingly needed 3 coats to get opaque but you can still see part of my nail if you look very closely. I personally wouldn't wear this shade by itself, but do you like it? Surf's Up! Yep, that's the name of this gorgeous sapphire-y blue shade! Of course, you know by I LOVE my blue shades and this one is no exception! This is 2 coats. I die!!! Last we have this pretty purple shade, Wild Bikini. This polish applied the smoothest, which I think is super weird. Lately a lot of the purple shades that I try go on the easiest. This is another one that went on in 2 coats and one I'd wear often. So, tell me...what are YOU doing this weekend? My parents are on their way down to visit me and I'm so excited! This is the first time they'll be seeing our new house AND I get to make wontons with my dad. This is a nice collection. I quite like all the colors too.